We manufacture different types of tweezers in Carbon stainless steel, Anti magnetic Anti acid stainless steel and in Titanium for verity of medical use. We can manufacture any type of tweezers according to the request of the buyer. Titanium Tweezers are light weight. In fact they are 45% lighter than the stainless steel Tweezers. They are antimagnetic and non-corrosive therefore are immune to rust. Titanium Tweezers have longer utility life than any steel material. Each Titanium tweezer is packed in hard plastic case. 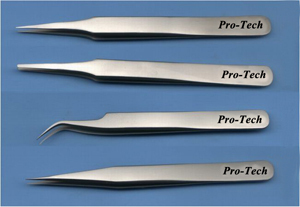 Stainless Steel Tweezers are anti-magnetic, non-corrosive and acid resistant. Forged from the best grade of steel and machined to smooth finish, these, tweezers are packed in a pouch. Copyright © 2019 surgicalinstrumentsonline.com. All rights Reserved.